In part one, we established what we need to remember, forget and recognise (and thanks so much for all your positive feedback!) Now we will explore how restoring balance can successfully minimise the effects and damages of stress, which I hope you find just as helpful. As stress is chaos, it needs to be balanced with moments of calm - which need to be consistently practised. I know a fair few people (including many of my personal trainer clients when we first met) with numerous meditation apps on their phones…which aren’t doing much good if never opened! movement – that you enjoy! I have personally found that the most effective method of maintaining a sense of balance in stressful times, is a concept recently introduced to me: ‘maintaining minimums’. 1. Daily movement. Whether it’s weights, dancing or yoga, movement for me is constant and therefore reliable. I’ve now practised it for long enough that my body expects it – something I never thought I’d say! 2. Fruit & veg. I've had enough practice of learning that the combination of stress and stodge has the opposite effect of calming! Planning my meals also circumvents this. 3. An electronic sundown. This takes place before bed, where all devices are switched off thus disconnecting me. It feels pretty amazing to just be at one with a book, without the distractions of emails and social media! 4. Breathing. 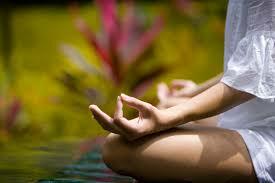 This might be within a guided meditation or a few quiet moments focused on mindful breathing. What we need to remember about minimums, is that they’re easy to do when stress levels are low! They happen without thought and we believe we have the time to practice them. Daily practice of minimums, or any stress management techniques helps you balance out your stress before it becomes chaos. And, most importantly, means that when they are needed, you’ll be highly adept at them. So I wish you all the very best in your practice and may your days be calm starting with today!